I had read quite a few reviews of this book, and still I don’t think I fully grasped what to expect. Back in January both yesknopemaybe and sistercoyote’s reviews of this book got me to add it to both my to read list, and found it a home on my Read Harder Challenge. My exact words were “Okay, that’s it, you all win. On the to read list it goes. I’m not even that big a Sherlock Holmes fan (hush, I know, I know. )” At the end of my reading experience I’m left feeling a little unfulfilled, I don’t know if it’s because I’ve never been a huge Sherlock Holmes fan (narfna is quietly sighing in a corner somewhere, I can feel it) or misplaced expectations, or first book in a series hiccups, but while I did eventually fall in deep like with Charlotte Holmes and her compatriots, it never really sang for me and I’m landing at 3.5 stars. Like the Arthur Conan Doyle novels it grows from, A Study in Scarlet Women takes place in Victorian England. When we met them, the Holmes family is upper class and struggling to keep up financial appearances due to poor choices of the patriarch. Lady Holmes is therefore eager to get her eligible daughters wed. Unfortunately, her younger daughters have other agendas. Following a betrayal by her father, Charlotte enacts a plan to make herself independent by becoming a fallen (or scarlet) woman and, being caught in flagrante, is to be sent away. Instead she runs away and is living as a social pariah, trying to figure out how to earn her own living in London with no training, no references, and meager resources. Initially I had a terrible time following some of the lengthy background we’re given. Charlotte Holmes, already under the guise of Sherlock Holmes, has helped solve crimes with Lord Ashburton working as an intermediary to bring information to and from Inspector Treadles. I could not for the life of me keep the timing straight, or initially keep Ingram separate from Roger Shrewsbury, which now seems silly to me as they were written very differently. We’re meant to be joining a plot already in action, but when Thomas took a step back for a large infodump of the Holmes’ past and laying out the relationships amongst the sisters I lost the thread of the “present”. There was also much I enjoyed about the novel. The world Charlotte lives in is complex and finely drawn, we are introduced to various characters and locales and once Thomas gets going everything is beautifully distinct. 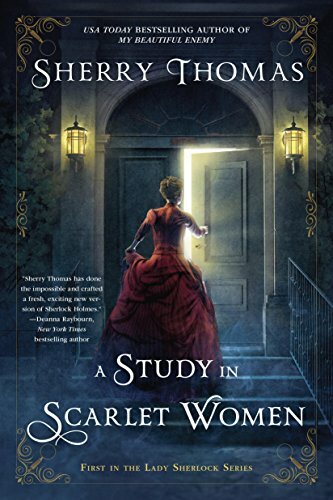 Thomas uses three voices to tell the story of the scarlet women – we hear from Charlotte, her sister Livia (although I would have liked to hear from her more in the second half of the book), and Investigator Treadles. It was always clear which character is delivering the narrative, each with rich interior and exterior lives, and learning things about themselves and the world around them in all its splendor and dinginess. But, the parallel narrative of the deaths Treadles is investigating and the life Charlotte is hoping to build to have financial independence for herself and her sisters didn’t always line up, or feel equally strong. It is unsurprising to me that it is the characters that shine and really drew me in. Charlotte, for all her massive intellect, observational, and deductive skills, is still quite a sheltered young woman. She makes youthful mistakes and doesn’t know everything and is in need of community. The eventually revealed Mrs. Watson is thus the perfect foil for Charlotte because she has life experience and self-awareness to bring to the table. It was this novel’s version of Watson that finally sold me on the book, and the way in which she was further woven into the structure of Charoltte’s life was artfully and gently done. I’ve added the next in the series to my to read list. The book got stronger as it went, and that’s the kind of thing I’m always willing to reward. I had such hopes for this one. I have a noted love of Craig Ferguson. I read and enjoyed his autobiography American On Purpose during my first Cannonball Read. Ferguson in this debut is the version creepy but lovable, which is a combination that worked very well for me in his stint as host of The Late Late Show and works less well in this book. I’m still struggling to wrap my head around what I read and what the heck he was after, and I have two weeks to get those thoughts more formulated for honest discussion with my fellow cannonballers but for now I’m left a bit at loose ends. We have, at the core of the book, two pairs of men traversing life, the globe, and the metaphysical in search of… something. Around that core we also have a truly problematic book to read today. The worst parts of Ferguson’s shtick (of which I can admit to, while I loved his late night show and his comedy specials) stand out in stark relief against the more nuanced aspects of his writing. He lays in repetitive phrasing in a way to form the Greek chorus in the background which I found highly enjoyable, but also appears to have not managed to write a single woman with agency in his entire book. Ferguson is on the record as saying that the book would likely be uncomfortable to read as it was uncomfortable to write, and that its pushing against mores, institutions, and values would be divisive. They were, but not in the intelligent manner I think Ferguson was really after. The title refers for one last chance at redemption, I think Ferguson’s redemption happened after this book not during it. This book was read as part of the charitable Cannonball Read, and specifically both our Book Club and Bingo. Book Club is being held 2-3 November 2018, so stop on by and tell us what you think. When the Cannonballers were voting for the AlabamaPink book club this book was my second choice (my first choice was Between the Bridge and the River and I’ll be talking about my feelings on that one in my next review) so choosing this for the AlabamaPink bingo square made perfect sense to me. I like biographies, Audrey Hepburn, and classic Hollywood – done and done. I am however left underwhelmed by the reading experience of this book. I think it can be attributed to the style of Donald Spoto. Spoto is a writer and theologian known for his best-selling biographies of film and theatre celebrities, including Alfred Hitchcock, Laurence Olivier, Tennessee Williams, Elizabeth Taylor, Grace Kelly, Marlene Dietrich, and Marilyn Monroe. However, in the past forty years he has written around thirty books and I fear they may have become formulaic, or I am over a several hundred page walk through someone’s life in chronological order. This isn’t to say that Audrey Hepburn’s life wasn’t incredibly interesting in and of its own right – she lived through parental divorce, spending years at boarding school, living in Nazi-occupied Holland, an incredible rise to Hollywood stardom, her own failed marriages, struggles in motherhood, and important work with UNICEF in the later years of her life. I wish this book was as alive as Hepburn was; that it relished the life she lead instead of lapping at the edges of her deep ocean. While I would agree that Spoto is perceptive and well-researched (his endnotes give this evidence, you wouldn’t necessarily know from the tenor of his writing), he is also as Michael Coveney of The Guardian described him: “quasi-academic gossipmonger”. Somewhere in between he lost me, and a review of a biography is a review of the writer and their product – not the subject. I guess I’m the cynic. This book was read and reviewed as part of the charitable Cannonball Read where we read what we want, review it how we see fit (within a few guidelines), and raise money for the American Cancer Society in the name of our fallen warrior queen, AlabamaPink. For my forty ninth book of the year I read Crimson Peak: The Official Movie Novelization with two of my dearest friends who participate in Cannonball Read with me and are also working on completing the #CBR10Bingo squares. This book was read and reviewed as part of the charitable Cannonball Read where we read what we want, review it how we see fit (see above word vomit review), and raise money for the American Cancer Society in the name of a fallen friend.